The feast day of the patron saint of England, and the saint after whom St George’s Chapel is named, falls on the 23rd April. 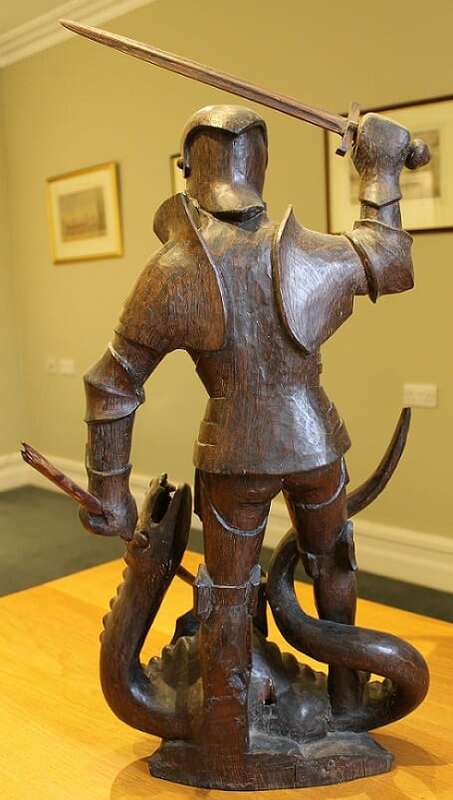 Here in the Archives we have decided to take a look at the many depictions of St George that are spread around the College to see how he has been represented over the centuries by different craftsmen and in different media. This image of the month feature is the first of these. Head over to our blog throughout April to discover the other St Georges of St George’s. We shall begin the series with what may be one of the oldest surviving effigies of St George, which was possibly commissioned for the Chapel in the late 15th century by King Edward IV, who instigated the rebuilding of the Chapel into the magnificent building that you see today. This stunning sculpture, though it no longer stands in the Chapel itself, is a testament to the skill and expertise of the medieval craftsmen who carved it. Now housed in the Chapel Archives, it depicts St George in his most well-known role as slayer of the dragon. It is possible that this carving is the one that is described in the accounts of the exchequer, housed in The National Archives, for the year 1477-8. In these accounts it is noted that two men, Dirike Vangrove and Egidio van Castell, were paid £7, equivalent to approximately £3,500 today, for carving an image of St George and the dragon to go in the Chapel. This phenomenal sum of money for a single carving helps to explain why the depiction is so detailed. St George’s facial features are strong as he raises an armoured arm to finish the dragon off. The dragon, too, is both fearsome and tortured as it wraps its ridged tail around St George’s leg. The spear that St George is still clinging onto has pierced the dragon’s neck and it is clear that this battle is almost over. It is likely that this depiction of St George was located within the quire of the Chapel on one of the screens that abuts the organ loft. A great number of carvings of saints are depicted on these screens, each mounted on a plinth. When scaffolding was put up in the quire recently to enable the woodwork to be cleaned, it was possible to see close at hand that the screens have been shortened in the past. Indeed, half of an empty plinth is visible on each of the screens where they adjoin the organ loft. Furthermore, there is a second wooden carving of St John the Evangelist, now located in the vestry, which is of very similar dimensions to the carving of St George. These coincidences lead us to believe that each of these carvings was originally positioned on these screens, although when they were removed is a matter of speculation. If the figure of St George was located on one of the screens, it would have been difficult to see from the ground and only the front of it would have been on display. Nevertheless, the attention to detail of the effigy, both front and back, is remarkable. Despite the fact that this carving has been removed from its original context, we are glad that it was kept so that anyone visiting the Archives may now see and admire its medieval craftsmanship close-up. Go to our blog to read about the other images of St George that are located around the College and let us know on Facebook whether you have spotted them all in person.